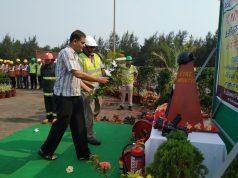 Barbil: The fourth International Yoga Day was celebrated today at the pellet plant premises of Jindal Steel and Power Ltd. (JSPL) which started with Suryanamaskar and Kriytmaka yoga activities. 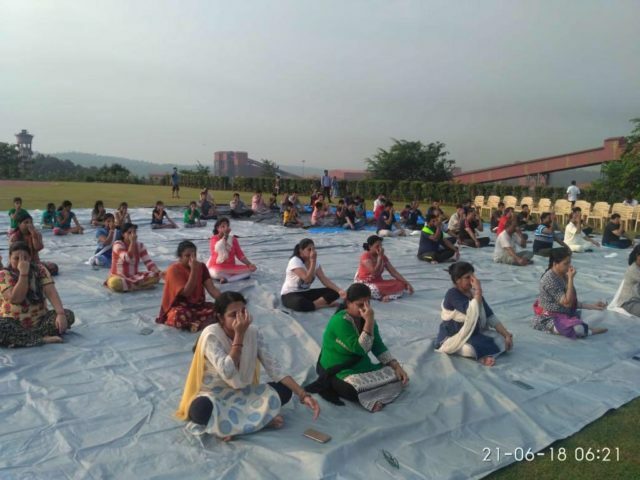 Nearly 200 yoga enthusiasts including women and children participated in the hour-long programme which was inaugurated by JSPL Barbil Unit Head Shri Suresha G.
Addressing the gathering Shri Suresha G said, “Yoga guarantees wellness as well as fitness. Yoga is not merely an exercise but a way to attain peace through physical, mental and spiritual well-being”. He said, “Yoga is the journey of the self, through the self, to the self”. The Yoga Day celebration led by a Yoga instructor witnessed employees perform physical, spiritual and mental exercises. While interacting with the instructor, the participating children received tips how to practice asanas and pranayama. Vice President and Head, Human Resources Shri BB Pradhan delivered speech on the importance and enormous benefits of asanas in our daily life that can cure mind and health. Among others Executive Vice President (F&A) Shri SK Agrawal and Vice President VCS Rao (Projects & Commercial) were present on the occasion. June 21 is also observed as the summer solstice in the northern hemisphere, the longest day of the year for people living in the north of the equator.